TTI TriMetrix® ACI examines the behaviors individuals bring to the job, the motivators that drive them, and an understanding of how they analyze and interpret their experiences, or their “acumen.” This report blends behaviors and motivators together in an integrated section that will help blend the how and the why of an individual’s actions. These reports consist of three sciences: behaviors, motivators and acumen. 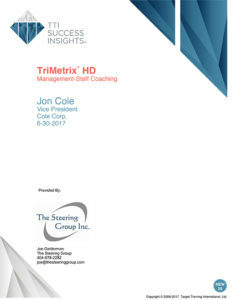 TTI TriMetrix® DNA examines the behaviors individuals bring to the job, the driving forces that drive them, and the ability to demonstrate the competencies required by the job. TriMetrix DNA reveals specific details in these three areas that describe the how, why and what of superior performance. In addition, this report blends behaviors and driving forces together in an integrated section that will help you blend the how and the why of a person’s actions. These reports consist of three sciences: behaviors, driving forces and competencies. TTI TriMetrix® EQ examines the behaviors individuals bring to the job, the motivators that drive them, and an understanding of their own emotional intelligence. This report blends all three sciences together in an integrated section that will illustrate the impact emotional intelligence has on core behavioral styles, as well as the top two motivators. These reports consist of three sciences: behaviors, motivators and EQ.